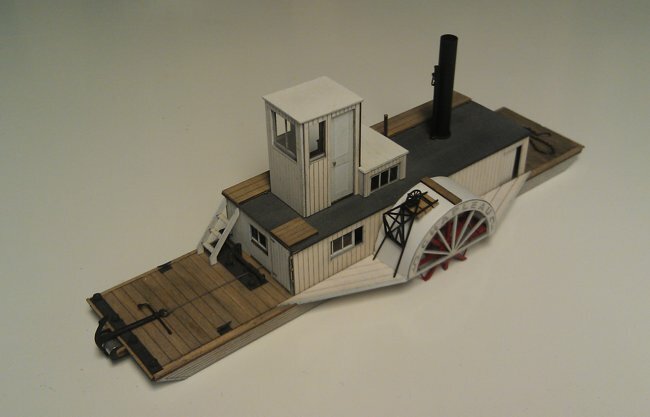 O Scale (1:48) Baby Alligator Warping Tug "Chapleau"
The Baby Alligator proved popular with operations not requiring the capability of the standard size warping tugs. The wheel house was just large enough for the captain and with no above deck sleeping arrangements or cooking facilities. These small paddlewheelers were built by West & Peachey (Simcoe, Ontario) from 1907 till 1918 for various wood and lumber companies in Ontario and Quebec. These tugs were fully amphibious work vessels. They were fitted with two large oak hull skids and would portage themselves overland using their own steam powered winch and cable. This waterline craftsman kit builds No.77 "Chapleau" and uses a modification kit (O-111-MOD) to convert the "Alice" Baby Alligator Warping Tug kit O-104 into the "Chapleau" kit O-111-A. This also allows for various modifications and custom alterations using components from O-104. For those who have an available "Alice" kit, the separate modification kit may be purchased separately.